China and France have boosted industrial cooperation in recent years and nuclear energy and aerospace, key cooperation areas for China's opening-up, have witnessed major development as the two nations expand their economic ties. Nuclear energy and aerospace are two major traditional areas for bilateral economic ties, which have a deep foundation and smooth cooperation experience, Chen Xin, research fellow and director of the economic division of the Institute of European Studies at the Chinese Academy of Social Sciences, told the Global Times on Wednesday. Nuclear power cooperation between China and France can be traced back to as early as 1978, when former Chinese former leader Deng Xiaoping announced the nation would introduce French technology to build a large nuclear power plant in Dayawan, South China's Guangdong Province, a note sent by China General Nuclear Power Corp (CGNPC) on Tuesday showed. The note said the nuclear power cooperation has gone through three stages, developing from the projects in Dayawan to Taishan in Guangdong Province and the UK. Since the nuclear project in the UK started in 2015, cooperation between CGNPC and EDF in France has developed further as they have teamed up to enter third markets, the note said. Meanwhile, in terms of aerospace, Airbus plays a big role. The industrial cooperation between Airbus and the Chinese aviation industry dates back to 1985, when the first airplane was introduced into China, Airbus said in a note sent to the Global Times on Wednesday. The total value of industrial cooperation between Airbus and the Chinese aviation industry reached $140 million in 2009, exceeded $200 million in 2010, reached about $500 million in 2015 and rose to $641 million in 2017, Airbus said. 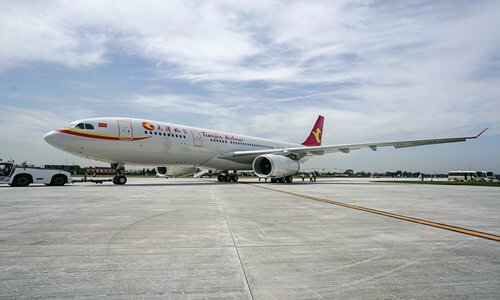 Airbus inaugurated its A330 completion and delivery center in North China's Tianjin Municipality in 2017, and the first A330 was handed over to Tianjin Airlines in the same year. More aerospace cooperation has also been witnessed by other players such as France-based Thales, as the company said it will provide in-flight entertainment for China's domestic narrow body C919 aircraft with the help of a joint venture. Sichuan Airlines' new A350 XWB is the first Airbus A350 in the Chinese region to be equipped with the Thales AVANT system, an in-flight entertainment solutions system. Thales has participated in the air traffic control project at Beijing Daxing International Airport, which will be open for use this year, the company said in a note sent to the Global Times on Wednesday. "Compared with other European countries, France has more multinational companies that can meet the rising infrastructure demand for big planes and nuclear power stations in the Chinese market," Chen said, adding that China provides a lucrative market for its French counterparts as the two countries strengthen their technology cooperation. China and France are at different stages of development, with strong economic and trade complementarities, providing opportunities for both sides to strengthen investment cooperation, according a report released by China's Ministry of Commerce in August 2018. The Chinese Foreign Ministry announced that Chinese President Xi Jinping would pay state visits to three European countries - Italy, Monaco and France - from Thursday to March 26. Vice Foreign Minister Wang Chao said China and France have made steady progress in jointly building the Belt and Road Initiative and pursuing third-party market cooperation, as well as in cooperation in the fields of nuclear energy, aerospace, agriculture, finance and sustainable development, the Xinhua News Agency said.